To celebrate its diamond anniversary, the Ulster Historical Foundation is hosting an evening of beautiful music and memories from the nine counties of Ulster. It will be held tomorrow, Saturday 4 February, at the 1st Presbyterian Church in Belfast. 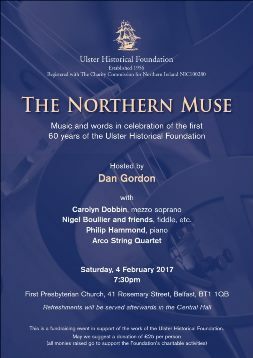 A tuneful and entertaining survey of northern music-making and writing across the years will be performed by Dan Gordon, Carolyn Dobbin; Nigel Boullier and friends; Philip Hammond; and the Arco String Quartet. Refreshments will be served afterwards in the Central Hall. This is a fundraising event for the Ulster Historical Foundation's work in genealogical and historical research services, publishing, hosting history events and delivering community education programmes. A suggested minimum donation of £25 per person is requested. This event will be held in the First Presbyterian Church, 41 Rosemary Street, Belfast, BT1 1QB, and starts at 7:30pm. Tickets.